The Master Makeup Course is for students who want to master their skills and become professional makeup artist. This makeup course includes a variety of makeup looks from introductory to advanced looks. You will also learn the fundamentals of pro makeup artistry and more! 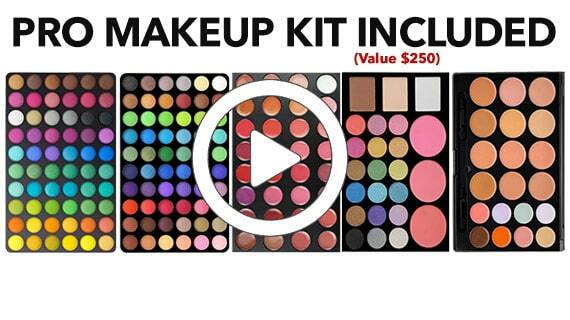 When you enroll into this course you will also receive the Master Pro Makeup Kit which includes: Vizio’s exclusive signature HD eye shadow palette and the exclusive Pro Brush Set with leather case. So much value packed into this master course! Do you want to become a professional makeup artist? Makeup artistry is a fun profession. Some people who love makeup artistry turned their passion into their profession by taking such excellent makeup courses. It is one main reason why some people really enjoy on making more people look good by means of using and applying appropriate shades and combinations of makeup products. If you are looking for the best makeup classes online then looks like that you do not need to search for more. 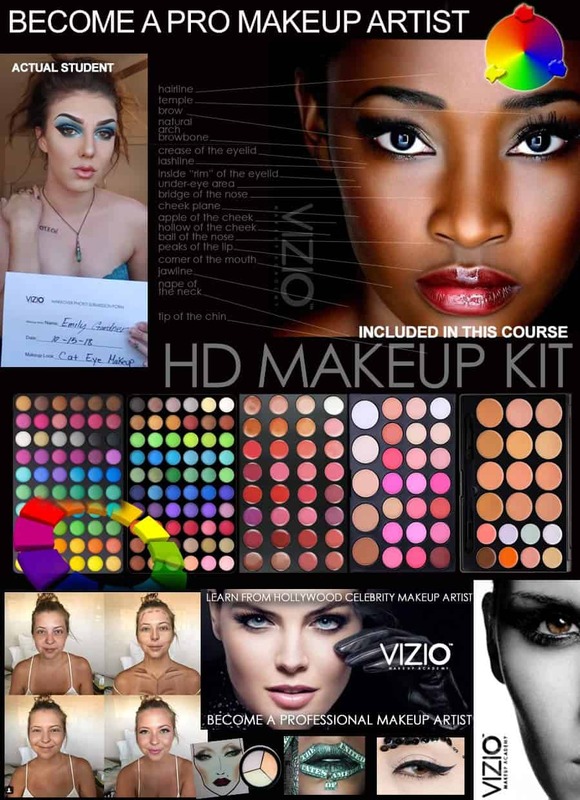 VIZIO Makeup Academy offers best makeup classes online. One of the best makeup classes online offered by VIZIO Makeup Academy is Master Makeup Artistry. Master Makeup Course is a popular online makeup class for students who want to master their skills on using makeup products. By means of enrolling at this make up course, you can become a professional makeup artist. Mastering your makeup artistry skills is essential if you want to become competent and efficient on this field. This course includes wide range of makeup lessons that will tackle from makeup artistry basic introductory up to the advanced level of makeup artistry. Students of this online makeup class will lead fundamentals of makeup artistry and many more. To enroll on this makeup online class is indeed a smart choice. Aside from the certificate and learning that you can get, you are also entitled to receive makeup kits from VIZIO Makeup Academy such as exclusive Pro Brush Set, Vizio’s exclusive signature HD color eye shadow palette and many more. The Master Makeup Course of VIZIO Makeup Academy is a complete and comprehensive makeup artistry lessons that will enable you to learn more things about this craft. Students of the Master Makeup Course offered by VIZIO Makeup Course are entitled to receive certification from the makeup school. Since the company is recognizes worldwide, students who got certification from the school are considered globally competitive. Graduates of this online makeup course are efficient and competitive makeup artists who are capable of providing stunning makeup services suitable for different makeup needs such as for every day makeup look, bridal makeup, Makeup for film and television, makeup for theater and many more. Graduating from Master Makeup Artistry Course offered by VIZIO Makeup Academy is a great privilege and achievement for aspiring makeup artists. So, if you are interested then you must not hesitate to consult VIZIO Makeup Academy. Learn more about makeup artistry through the help of VIZIO Makeup Academy.